What do you want me to say? Sorry you know so little about all of the world's happenings, and sorry that you have no friends that keep you in the know? As far as respect, at what point do you think I gave a rats rear about gaining the respect of a person such as yourself. (notice, no question mark at the end). Just in case you did see it as me asking you, I'm not, I couldn't care less. You don't know information, because you don't know how to seek information, not only that, flaming with others on message boards isn't going to automatically get you that, despite what the progressive spirit inside of you believes. Let me put this into context for you(the word you don't understand yet in your 36 years, but I'll use it anyways). The thread had a specific topic on a forum, you derailed the topic(not how forums work, but since it has been tolerated here, you must think that is how they work, another sure tell sign of someone who is not of a mature age, at least as far as the internet goes, and forums for sure). Then after the questions were answered specifically, instead of relaying the topic at hand, you did what exactly? Continued to change the topic, as if this were twitter or facebook, which does not have a forum format(topic-reply to topic). We're not talking a small derailment on a related topic, no, this is out of left field type of derailment. Let me remind you, for your sake, because you have demonstrated oft evidence that you have trouble re-reading. The topic was about the site being down for an extended period of time, and offering to help the site. Interesting show of character you have, because instead of echoing some sentiment to help this site in whatever capacity, you instead decided that this is a great time to flamebait. What's next? Are you going to tell me that you developed ARPAnet and have been using internet forums since Ben Franklin? You're not fooling anyone. You introduced these rallies into the discussion. Anybody trying to further the cause of liberty and draw new people into libertarianism would be delighted to have any publicity available to spread the word of libertarian rallies. Why on earth would they be secret? Like I said, in 36 years of involvement in libertarian causes, I've never heard of secret libertarian meetings. I guess I've just not yet penetrated the elite inner circle. I think some want it to be a club, and not really care to win elections. Some rallies are open, some are closed. This is the same for all collectives for a number of reasons. It shouldn't be of any surprise that being a practicing libertarian can also express much civil disobedience(and not for the sake of activism and getting attention). So why are some meetings and rallies so necessary to be open, is a wildly different topic. But understand, some people(as they are free to believe) some gatherings should be closed to those they can confirm are there to support common causes. Freedom of association. Find a liberty/libertarian group or chapter on campuses, then you have those rallies. Those are often more open, some are not. We have a local meetup here by invite only for working adults. I just found out about them 10 years ago and sometimes I go. Where I live, libertarian views have hurt careers, which is why we have meetings by invite only. None of this is even debatable. They happen. Some gatherings are only 10 people, some are bigger. But they happen. But understand, some people(as they are free to believe) some gatherings should be closed to those they can confirm are there to support common causes. Where I live, libertarian views have hurt careers, which is why we have meetings by invite only. It's sounds like you live in Czarist Russia in the early 1900's! Except libertarian ideas were pretty common and safe there. Maybe Russia after the 1917 Revolution is more appropriate. Perhaps you're just part of one of our Marxist University communities... but you seem to struggle with English, so I think perhaps you live in someplace like Venezuela. Obviously you don't live in a free country. So basically you no longer have any argument, and resort to making up details to push a narrative of your disillusioned non-point? Actually, I'm trying to understand you. I'll never understand the reasons for having secret or limited access libertarian rallies- isn't rally a word that implies calling people to join in? But the nice guy I am, I'll paint you a picture. I'll give you a general breakdown on some of the usuals that attend meetings. 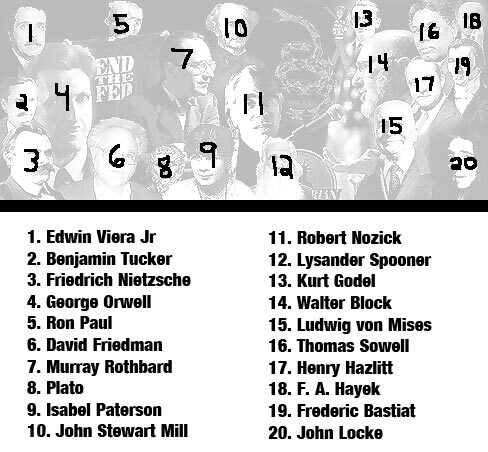 We have 8 medical doctors(that I personally know, could be more), all of which are libertarian-anarchists. But if word gets out they attend rallies or meetings, then they will get labeled as an activist. They know, because we also have blackballed members. Where I live, if you cross that line in certain professions, you put your career in jeopardy. It's not my place to tell them they are cowards for hiding, or not my fight to take it up with the old boys club that controls parts of their field. We also have a number of lawyers, a few of which are public defenders. To be anti-government in any way could also jeopardize their career. We have a number of teachers(public and private) who do not want to be known as libertarians to anyone outside of who they trust. Again, that is their call, not mine or anyone else. In addition to them, I'm a local business owner, and have been for over 20 years. I must run my business apolitically. I am recognizable to locals in the area, and hold a minor elected public office in my very blue county/state. I keep my views separate from my duties and bow to no party because I am recorded as Independent (big I). Democrats and Republicans are thugs, and would love to screw with the careers of a number of us. They have in the past many times, we have learned from past mistakes. There are open gatherings, and closed gatherings. Just because a rally occurs, does not mean anonymity is thrown out the window. You may be lucky wherever you live, but where I live, you COULD be labeled a domestic terrorist at some capacity for being a peaceful, contributing, NAP supporting anarchist. It has happened already, thus we aren't speculating possibilities, we already know certain consequences. Whether or not you want to accept facts, not my problem. Recent polls show that the majority of Americans are anti-government, at least opposed to the DemocraticRepublican government we have now. A large majority even believe our government is currently the greatest threat to our liberty. I live in a rural county in the S.E. U.S., the� Bible Belt, and haven't had any problems because I'm openly libertarian. I likely have been on the governments list of people to eliminate when the 'progressive' revolution finally gets underway for at least 30 years, so it's too late for me to keep a low profile. As for that, the government can easily find you, and your 'secret' libertarian cell was probably infiltrated very early on. If you won't speak openly and publicly, then you already live in a police state of your own making. BTW, thanks, I got a chuckle out of imagining one of your meetings, (sorry, rallies). Doctors, lawyers, teachers, business owners- and Waldo! I think your point was that libertarians need to go underground... I can't imagine that I proved that point, since I don't agree. My point was, I can imagine Waldo at some big outdoor rally in a stadium or University mall, amidst a big crowd of people. That's where Waldo typically shows up. But Waldo in a closed door meeting with a small number of doctors, lawyers, teachers and business leaders? As far as I know, Waldo has never, ever, shown up for something like that!